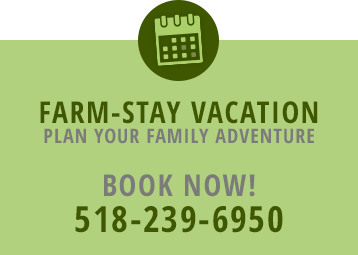 HULL-O FARMS Family Farm Vacations offers breakfast every morning in our 19th-century, upstate New York farmhouse. You will be treated to farm-fresh, all-you-can-eat, farm-style meals! Our guests enjoy our all-natural grass fed meats and farm-fresh produce (and usually end up taking some home with them). Some examples of our farm-style breakfast menu include: World-famous, melt-in-your-mouth buttermilk pancakes with real maple syrup and sweet cream butter, breakfast sausages, and farm fresh eggs.